British rock band Mumford & Sons have released four studio albums, two live albums, eleven extended plays (three studio, five live, and three collaborations), eighteen singles and thirteen music videos. 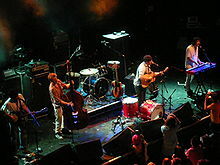 The band's debut studio album, Sigh No More, was released in October 2009. It was a commercial success, hitting the top ten in multiple countries, including their native United Kingdom, where it peaked at number 2. It has since been certified five times platinum by the British Phonographic Industry (BPI). Four singles were released from the album, including the international hits "Little Lion Man" and "The Cave". Babel, the band's second studio album, was released in September 2012. It was preceded by the release of its lead single, "I Will Wait", which peaked at number 12 in the UK and the US, as well becoming a top 40 hit in countries such as Australia. Their third album Wilder Mind debuted at number one in the UK, the US, Australia, Canada, Ireland, the Netherlands and Norway. "—" denotes a song that did not chart or was not released. ^ "The Cave" was originally released 11 months earlier, six months before "Little Lion Man" and Sigh No More were released. It was a limited edition single with a B-side different from the 2010 single release. ^ "Roll Away Your Stone" did not enter the Flanders Ultratop 50, but peaked at number 15 on the Ultratip chart. ^ "Lover of the Light" did not enter the Flanders Ultratop 50, but peaked at number 3 on the Ultratip chart. ^ "Whispers in the Dark" did not enter the Flanders Ultratop 50, but peaked at number 16 on the Ultratip chart. ^ "Babel" did not enter the Flanders Ultratop 50, but peaked at number 8 on the Ultratip chart. ^ "Hopeless Wanderer" did not enter the Flanders Ultratop 50, but peaked at number 32 on the Ultratip chart. ^ "Hopeless Wanderer" did not enter the Alternative Songs chart, but peaked at number 13 on the Alternative Digital Song Sales chart. ^ "The Wolf" did not enter the Flanders Ultratop 50, but peaked at number 4 on the Ultratip chart. ^ "The Wolf" did not enter the Netherlands' Single Top 100 but peaked on the Netherlands' Single Tip Chart at number 6. ^ "The Wolf" did not enter the Billboard Hot 100, but peaked at number two on the Bubbling Under Hot 100 Singles chart, which acts as an extension to the Hot 100. ^ "Ditmas" did not enter the Flanders Ultratop 50, but peaked at number 17 on the Ultratip chart. ^ "Tompkins Square Park" did not enter the Flanders Ultratop 50, but peaked at number 3 on the Ultratip chart. ^ "Tompkins Square Park" did not enter the Netherlands' Single Top 100 but peaked on the Netherlands' Single Tip Chart at number 10. ^ "Just Smoke" did not enter the Flanders Ultratop 50, but peaked at number 39 on the Ultratip chart. ^ "There Will Be Time" did not enter the Flanders Ultratop 50, but peaked at number 17 on the Ultratip chart. ^ "There Will Be Time" did not enter the Billboard Canadian Hot 100, but peaked at number 28 on the Canadian Digital Song Sales chart. ^ "There Will Be Time" did not enter the Netherlands' Single Top 100 but peaked on the Netherlands' Single Tip Chart at number 20. ^ "There Will Be Time" did not enter the Alternative Songs chart, but peaked at number 17 on the Alternative Digital Song Sales chart. ^ "Wona" did not enter the Flanders Ultratop 50, but peaked at number 25 on the Ultratip chart. ^ "Guiding Light" did not enter the Flanders Ultratop 50, but peaked at number two on the Ultratip chart. ^ "Guiding Light" did not enter the Netherlands Single Top 100 but peaked on the Single Tip Chart at number 13. ^ "Guiding Light" did not enter the NZ Top 40 Singles Chart, but peaked at number 12 on the NZ Hot Singles Chart. ^ "Guiding Light" did not enter the Billboard Hot 100, but peaked at number six on the Bubbling Under Hot 100 Singles chart, which acts as an extension to the Hot 100. ^ "If I Say" did not enter the Alternative Songs chart, but peaked at number 4 on the Alternative Digital Song Sales chart. ^ "Beloved" did not enter the Flanders Ultratop 50, but peaked at number 44 on the Ultratip chart. ^ "Snake Eyes" did not enter the Netherlands' Single Top 100 but peaked on the Netherlands' Single Tip Chart at number 1. ^ "Snake Eyes" did not enter the Billboard Hot 100, but peaked at number 11 on the Bubbling Under Hot 100 Singles chart, which acts as an extension to the Hot 100. ^ "Snake Eyes" did not enter the Alternative Songs chart, but peaked at number 10 on the Alternative Digital Song Sales chart. ^ "Hot Gates" did not enter the Netherlands' Single Top 100 but peaked on the Netherlands' Single Tip Chart at number 24. ^ "White Blank Page" did not enter the Alternative Songs chart, but peaked at number 22 on the Alternative Digital Song Sales chart. ^ "White Blank Page" did not enter the Hot Rock Songs Chart, but peaked at number 36 on the Rock Digital Song Sales Chart. ^ "Awake My Soul" did not enter the Flanders Ultratop 50, but peaked at number 26 on the Ultratip chart. ^ "Hold On to What You Believe" did not enter the Hot Rock Songs Chart, but peaked at number 42 on the Rock Digital Song Sales Chart. ^ "Lover's Eyes" did not enter the Alternative Songs chart, but peaked at number 16 on the Alternative Digital Song Sales chart. ^ "Below My Feet" did not enter the Billboard Hot 100, but peaked at number three on the Bubbling Under Hot 100 Singles chart, which acts as an extension to the Hot 100. ^ "Reminder" did not enter the Billboard Hot 100, but peaked at number six on the Bubbling Under Hot 100 Singles chart, which acts as an extension to the Hot 100. ^ "Broken Crown" did not enter the Billboard Hot 100, but peaked at number eight on the Bubbling Under Hot 100 Singles chart, which acts as an extension to the Hot 100. ^ "Where Are You Now" did not enter the Billboard Hot 100, but peaked at number 15 on the Bubbling Under Hot 100 Singles chart, which acts as an extension to the Hot 100. ^ "Where Are You Now" did not enter the Alternative Songs chart, but peaked at number 18 on the Alternative Digital Song Sales chart. ^ "Not with Haste" did not enter the Billboard Hot 100, but peaked at number 20 on the Bubbling Under Hot 100 Singles chart, which acts as an extension to the Hot 100. ^ "Wilder Mind" did not enter the Netherlands' Single Top 100 but peaked on the Netherlands' Single Tip Chart at number 17. ^ a b "Mumford & Sons" (select "Albums" tab). Official Charts Company. Retrieved 24 November 2018. ^ a b c d e f g h i j k l "Certified Awards Search" (To access, enter the search parameter "Mumford & Sons"). British Phonographic Industry. Retrieved 16 March 2011. All except "Roll Away Your Stone", "Lover of the Light" and "Whispers in the Dark": "Mumford & Sons". Official Charts Company. Archived from the original on 15 June 2011. Retrieved 5 August 2010. "Roll Away Your Stone": Zywietz, Tobias. "Chart Log UK: M – My Vitriol". zobbel.de. Retrieved 10 August 2012. "Lover of the Light": Zywietz, Tobias. "Chart Log UK – 2012". zobbel.de. Retrieved 10 February 2013. "Whispers in the Dark": Zywietz, Tobias. "Chart Log UK: New Entries Update – 30.03.2013 (Week 12)". zobbel.de. Retrieved 31 July 2013. "Hot Gates": Zywietz, Tobias. "Chart Log UK: New Entries Update - 09.05.2015 (Week 18)". zobbel.de. Retrieved 17 May 2015. ^ a b c d e "Discography Mumford & Sons". australian-charts.com. Retrieved 5 August 2010. "The Wolf": Ryan, Gavin (18 April 2015). "ARIA Singles: Wiz Khalifa and Charlie Puth Remain On Top". Noise11. Retrieved 18 April 2015. "Ditmas": Ryan, Gavin (19 September 2015). "ARIA Singles: Justin Bieber 'What Do You Mean' Keeps Top Spot". Noise11. Retrieved 19 September 2015. Johannesburg: Ryan, Gavin (25 June 2016). "ARIA Singles: Drake 'One Dance' Is Still No 1". Noise11. Retrieved 25 June 2016. ^ a b c d "Mumford & Sons Chart History: Hot 100". Billboard. Retrieved 25 September 2018. ^ "Discografie Mumford & Sons". austriancharts.at (in German). Retrieved 16 February 2014. ^ a b c d e f g h i j k l m n o p q r "Discografie Mumford & Sons". ultratop.be. Retrieved 5 August 2010. ^ "Mumford & Sons Chart History: Canadian Albums". Billboard. Retrieved 29 November 2018. ^ a b "Discographie Mumford & Sons" (enter "Mumford & Sons" into the "Suchen" box). GfK Entertainment. Retrieved 23 November 2018. ^ a b c "Discography Mumford & Sons". irish-charts.com. Retrieved 5 August 2010. ^ a b c d "Discografie Mumford & Sons". dutchcharts.nl. Retrieved 5 August 2010. ^ a b c d "Discography Mumford & Sons". charts.org.nz. Retrieved 5 August 2010. ^ a b "Discography Mumford & Sons". swedishcharts.com. Retrieved 3 March 2015. ^ a b "Mumford & Sons Chart History: Billboard 200". Billboard. Retrieved 23 September 2018. ^ a b Jones, Alan (11 May 2015). "Official Charts Analysis: Mumford & Sons score second No.1 with sales of 81,351". Music Week. Intent Media. Retrieved 14 March 2018. ^ "Chart Moves: Grateful Dead's Highest Charting Album Since 1987, Mumford & Sons' 'Sigh' Hits 3 Million & Josh Groban's TV-Fueled Return". Billboard. 27 September 2013. Retrieved 15 May 2014. ^ "ARIA Charts – Accreditations – 2011 Albums". Australian Recording Industry Association. Retrieved 16 March 2011. ^ a b "Ultratop − Goud en Platina – 2011". Ultratop. Hung Medien. ^ a b c d e "Gold-/Platin-Datenbank: Mumford & Sons" (in German). Bundesverband Musikindustrie. Retrieved 7 September 2018. ^ a b c "Gold & Platin" (in German). International Federation of the Phonographic Industry. Archived from the original on 1 February 2010. Retrieved 16 February 2014. ^ a b c d e f g h i "Canadian certifications – Mumford & Sons". Music Canada. Retrieved 14 October 2011. ^ a b c d e f g "American certifications – Mumford". Recording Industry Association of America. Retrieved 7 January 2012. ^ "NZ Top 40 Albums Chart – 20 August 2012". Recorded Music NZ. Retrieved 2 October 2012. ^ Caulfield, Keith (6 May 2015). "Mumford & Sons Set for Second No. 1 Album on Billboard 200 Chart". Billboard. Prometheus Global Media. Retrieved 7 May 2015. ^ "ARIA Charts - Accreditations - 2013 Albums". Australian Recording Industry Association. ^ "Ultratop − Goud en Platina – 2012". Ultratop. Hung Medien. ^ "Certifikat Mumford & Sons" (in Swedish). Grammofon Leverantörernas Förening. Retrieved 3 March 2015. ^ "The Official Swiss Charts and Music Community: Mumford & Sons". swisscharts.com. Retrieved 3 March 2015. ^ "2012 Multi-platinums". irishcharts.ie. Retrieved 28 September 2013. ^ "NZ Top 40 Albums Chart – 07 January 2013". Recorded Music NZ. Retrieved 11 January 2013. ^ "Nielsen & Billboard's 2015 Canadian Music Industry Sales Report". 8 January 2016. ^ "Upcoming Releases". Hits Daily Double. Archived from the original on 5 May 2016. ^ Ryan. "ARIA Albums: Tame Impala Currents Debuts At No. 1". ARIA. Retrieved 13 April 2019. ^ "New Zealand album certifications". Recorded Music NZ. Retrieved 13 November 2015. ^ "Delta by Mumford & Sons". iTunes (UK). Retrieved 27 September 2018. ^ "ARIA Australian Top 50 Albums". Australian Recording Industry Association. 26 November 2018. Retrieved 24 November 2018. ^ Caulfield, Keith (25 November 2018). "Mumford & Sons Score Third No. 1 Album on Billboard 200 Chart With 'Delta'". Billboard. Retrieved 26 November 2018. ^ a b c "Mumford & Sons – Awards". AllMusic. Rovi Corporation. Retrieved 10 August 2012. ^ "Mumford & Sons – Chart History: Folk Albums". Billboard. Prometheus Global Media. Retrieved 10 August 2012. ^ "The Road to Red Rocks – Mumford & Sons". AllMusic. Rovi Corporation. Retrieved 19 January 2013. ^ a b Zywietz, Tobias. "Chart Log UK: M – My Vitriol". zobbel.de. Tobias Zywietz. Retrieved 10 August 2012. ^ a b "Billboard 200 – Issue Date: 2011-02-26". Billboard. Prometheus Global Media. Retrieved 10 August 2012. ^ a b "Top Modern Rock/Alternative Albums – Issue Date: 2011-02-26". Billboard. Prometheus Global Media. Retrieved 10 August 2012. ^ a b "Folk Albums – Issue Date: 2011-02-26". Billboard. Prometheus Global Media. Retrieved 10 August 2012. ^ a b "Top Independent Albums – Issue Date: 2011-02-26". Billboard. Prometheus Global Media. Retrieved 10 August 2012. ^ a b "Top Rock Albums – Issue Date: 2011-02-26". Billboard. Prometheus Global Media. Retrieved 10 August 2012. ^ "Mumford & Sons – Discography – Mumford & Sons". mumfordandsons.com. Island Records. Retrieved 16 March 2011. ^ "Mumford & Sons – Discography – Love Your Ground". mumfordandsons.com. Island Records. Retrieved 16 March 2011. ^ The Wedding Band – The First Dance (track listing). Mumford & Sons. Chess Club. 2010. Wedding1. ^ "NZ Top 40 Albums Chart". Recorded Music NZ. 27 June 2016. Retrieved 24 June 2016. ^ "iTunes Festival: London 2009 – EP by Mumford & Sons". iTunes Store. Apple. Retrieved 16 March 2011. ^ "iTunes Festival: London 2010 – EP by Dharohar Project, Laura Marling & Mumford & Sons". iTunes Store. Apple. Retrieved 16 March 2011. ^ a b c "Mumford & Sons Chart History: Billboard Canadian Hot 100". Billboard. Retrieved 25 September 2018. ^ a b c "Mumford & Sons Chart History: Alternative Songs". Billboard. Retrieved 24 September 2018. ^ a b c "Mumford & Sons Chart History: Rock Songs". Billboard. Retrieved 1 October 2018. ^ a b c "ARIA Charts – Accreditations – 2013 Singles". Australian Recording Industry Association. Retrieved 13 June 2013. ^ a b "Latest Gold / Platinum Singles". RadioScope. Archived from the original on 24 July 2011. Retrieved 10 August 2012. ^ "Mumford & Sons – Discography". mumfordandsons.com. Island Records. Retrieved 8 December 2012. ^ "ARIA Charts – Accreditations – 2010 Singles". Australian Recording Industry Association. Retrieved 29 August 2010. ^ "NZ Top 40 Singles Chart – 07 January 2013". Recorded Music NZ. Retrieved 11 January 2013. ^ a b c d e f g "Billboard.biz: Mumford & Sons – Alternative Digital Song Sales". Billboard. Retrieved September 20, 2018. ^ "Netherlands Single Tip Chart - April 18, 2015". Mega Charts. April 18, 2015. Retrieved August 1, 2018. ^ a b c d e f g h "Mumford & Sons – Chart History: Bubbling Under Hot 100". Billboard. Retrieved 2 October 2018. ^ "Netherlands Single Tip Chart - May 16, 2015". Mega Charts. May 16, 2015. Retrieved August 1, 2018. ^ "Mumford & Sons: Hot Canadian Digital Songs". Billboard. Retrieved 23 September 2018. ^ "Netherlands Single Tip Chart - April 30, 2016". Mega Charts. April 30, 2016. Retrieved August 1, 2018. ^ "Netherlands Single Tip Chart – 29/09/2018". MegaCharts. Retrieved 29 September 2018. ^ a b "NZ Hot Singles Chart". Recorded Music NZ. 26 November 2018. Retrieved 23 November 2018. ^ "iTunes - Mumford & Sons - Beloved (Single Version)". Retrieved 21 March 2019. "White Blank Page": Zywietz, Tobias. "Chart Log UK: M – My Vitriol". zobbel.de. Tobias Zywietz. Retrieved 10 August 2012. "Timshel": "Mumford & Sons". Official Charts Company. Archived from the original on 15 June 2011. Retrieved 5 August 2010. "The Boxer" and "Where Are You Now": Zywietz, Tobias. "Chart Log UK – 2012". zobbel.de. Tobias Zywietz. Retrieved 10 February 2013. Wilder Mind album tracks: Zywietz, Tobias. "Chart Log UK - New Entries Update - 16.05.2015". zobbel.de. Tobias Zywietz. Retrieved 17 May 2015. ^ "Irish Charts – Week ending 27th September 2012". Irish Recorded Music Association. Archived from the original on 29 September 2012. Retrieved 29 September 2012. ^ "Triple A – August 18, 2012". Billboard. Retrieved 9 May 2013. (Subscription required (help)). ^ a b "Mumford & Sons – Chart History: Rock Digital Song Sales Chart". Billboard. Retrieved April 21, 2018. ^ Erlewine, Stephen Thomas. "See My Friends – Ray Davies". AllMusic. Rovi Corporation. Retrieved 10 August 2012. ^ Phares, Heather. "Brave [Original Score] – Patrick Doyle". AllMusic. Rovi Corporation. Retrieved 10 August 2012. ^ "You & I Belong – Single by Simone Felice". iTunes Store. Apple. Retrieved 10 August 2012. ^ The Brightest Lights (track listing). King Charles. Universal Republic. 2012. KC7. ^ Leight, Elias (March 15, 2018). "Miley Cyrus, Lady Gaga, Ed Sheeran Set for Two Elton John Tribute Albums". Rolling Stone. Retrieved September 16, 2018. ^ "Little Lion Man | Mumford & Sons | Music Video". MTV Music. MTV Networks. Retrieved 10 August 2012. ^ "The Cave | Mumford & Sons | Music Video". MTV Music. MTV Networks. Retrieved 10 August 2012. ^ "Roll Away Your Stone | Mumford & Sons | Music Video". MTV Music. MTV Networks. Retrieved 10 August 2012. ^ "I Will Wait | Mumford & Sons | Music Video". MTV Music. MTV Networks. Archived from the original on 9 December 2012. Retrieved 18 September 2012. ^ "Lover Of The Light | Mumford & Sons | Music Video". MTV Music. MTV Networks. Retrieved 10 November 2012. ^ "Babel | Mumford & Sons | Music Video". MTV Music. MTV Networks. Retrieved 23 July 2013. ^ "The Wolf - Official Video - Mumford & Sons". Mumford & Sons. ^ "Ditmas - Official Video - Mumford & Sons". Mumford & Sons. ^ "Mumford & Sons Release "Guiding Light" Video, Confirm Worldwide Tour Dates". www.pastemagazine.com. Pastemagazine. Retrieved 17 October 2018. ^ "Mumford & Sons - Beloved (Official Video)". www.youtube.com. YouTube. Retrieved 20 March 2019.